Anxiety is one of the most common mental illnesses in America, affecting 18 percent of the population (that’s 40 million adults age 18 and up). Luckily, treating anxiety disorders is common. Many people who suffer from anxiety talk to a therapist, take medication, or even try calming activities such as yoga and meditation. But science also shows a connection between the foods we eat—more specifically the types of nutrients and at what frequency we consume them—and our mental health. Who knew how far a trip to the fridge could really go? Here, we break down the best foods to help keep stress at bay, along with foods that may add unneeded anxiety. 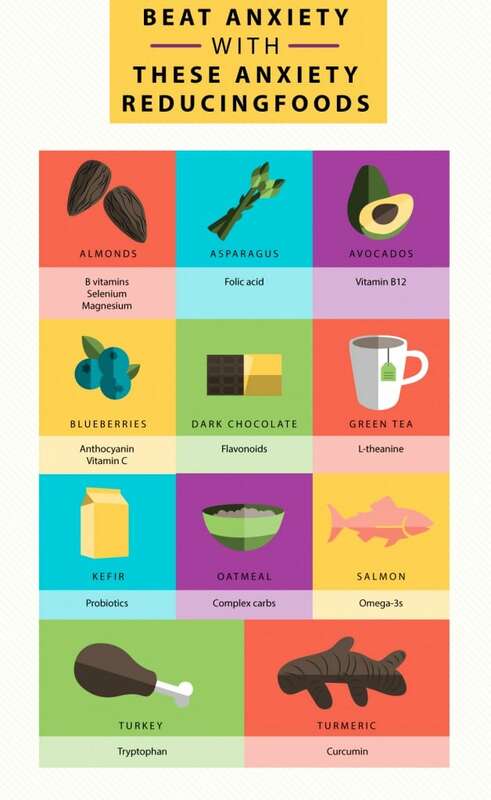 Eat Away Unease With These Foods! This fruit may look tiny but packs a huge stress-beating punch. Antioxidants and vitamin C—which blueberries are full of—are known to reduce anxiety. A one-cup serving contains 24 percent of the daily recommended vitamin C intake. Blueberries are especially rich in antioxidant flavonoids called anthocyanin, which give blueberries their color. Add them to your morning oats or cereal, or just snack on them any time of day. Almonds are rich in the mineral selenium, which has been linked to stress reduction. It gets better, too: almonds have B vitamins and magnesium, which help produce serotonin—a key chemical known to regulate mood and relieve anxiety. Stick to a hearty handful (about 23 almonds) for a heart-healthy and stress-reducing snack. Alternatively, spread almond butter on toast or add chopped almonds to a salad. Complex carbs also boast plenty of serotonin power—and oatmeal is a perfect source of these healthy carbohydrates. Just remember to skip the instant oatmeal, which has added sugar. Plus, the old-fashioned rolled oats are thicker and supply more fiber. You’ll stay full longer, and those calming effects may remain in the body for an extended period of time. Nobody can pass on a delicious side of roasted asparagus topped with a bit of Parmesan cheese. And perhaps for good reason: Asparagus is chock-full of folic acid. Studies suggest there’s a connection between depression and low levels of folic acid, so make sure to get in your greens. Asparagus is also great in omelets, or steamed and paired with your favorite dip. Similar to folic acid, lack of vitamin b12 may be another cause of anxiety and depression. The solution is delicious: Avocados are rich in this vitamin, and can easily be added to almost any meal. Enjoy avocado toast for breakfast, throw an avocado in a smoothie, add one to a salad, or go all-out at the next Mexican feast. Just remember that avocados are also high in fat (albeit the healthy kind), so stick to one serving—roughly 1/5th of the fruit. 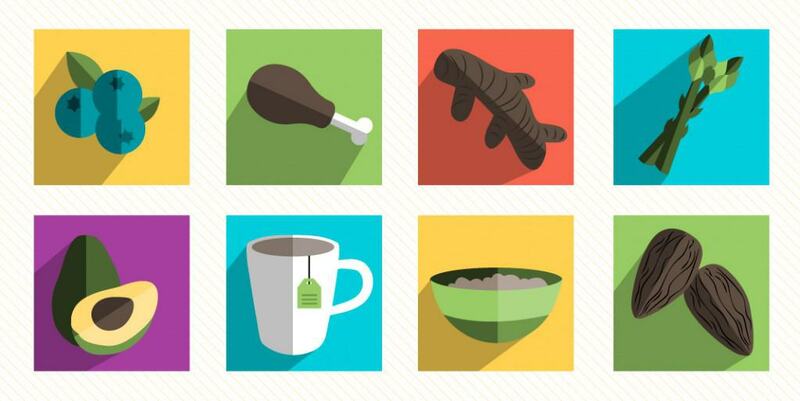 The amino acid tryptophan may make you sleepy, but it also helps combat stress. Here’s how: It helps usher certain neurotransmitters throughout the body, such as serotonin—which helps improve moods. Aside from a hearty turkey breast sandwich, other foods such as spinach and egg whites also feature good levels of tryptophan. Anyone want a turkey, egg, and spinach sandwich for breakfast? Kefir is a fermented dairy drink, usually made with cow’s or goat’s milk. Scientists have discovered that having an unhealthy gut (aka bacterial imbalances) can change brain chemistry. Kefir is a great food to promote gut health, since it’s full of probiotics and other essential nutrients. Try drinking it straight up, or use it in salad dressing, a veggie dip, or even kefir cheese. Bring on the salmon avocado rolls. Scientists have recently discovered an interesting link between eating salmon and reducing stress. Consuming 2.5 grams of omega-3s—or eating 12 ounces of salmon, a nice serving size—can reduce anxiety by more than 20 percent. Omega 3s are fatty acids that not only have stress-busting abilities, but can also lower triglycerides (bad fats) and help ease joint pain. Omega 3s are found in other fish including anchovies, mackerel, and tuna. Not a fish fan? Try fish oil supplements instead. Ah, a nice hot cup of tea. Of course it’s known for making you feel calm, and now there’s some science to back it up. The amino acid L-theanine which is found in green tea has a direct effect on the brain, and can help lower a thumping heart rate and reduce blood pressure. Chamomile tea is another nice option; some of its compounds act similarly as anxiety medications such as Valium. Try drinking a cup before bed at night: It could help promote relaxation and a good night’s rest, too. Science has found a connection between this yellow spice and the prevention of anxiety disorders. Curcumin boosts a specific acid in the brain that’s connected to reducing anxiety and strengthening the brain. Some say it could even be more powerful than certain drugs used to treat depression. It’s common in many Indian cuisines, but you can add it to egg scrambles, roasted vegetables, rice, or even tea. We definitely can’t skip dessert. The stress-busting antioxidants found in blueberries are also found in cocoa. One research study had participants eat dark chocolate for two weeks and discovered reductions in certain stress hormones in the brain. Just remember healthy moderation in the chocolate consumption. A square or two from a chocolate bar satisfies the sweet tooth and stress levels. As you know, food is a powerful thing and can affect our moods in more ways than one. 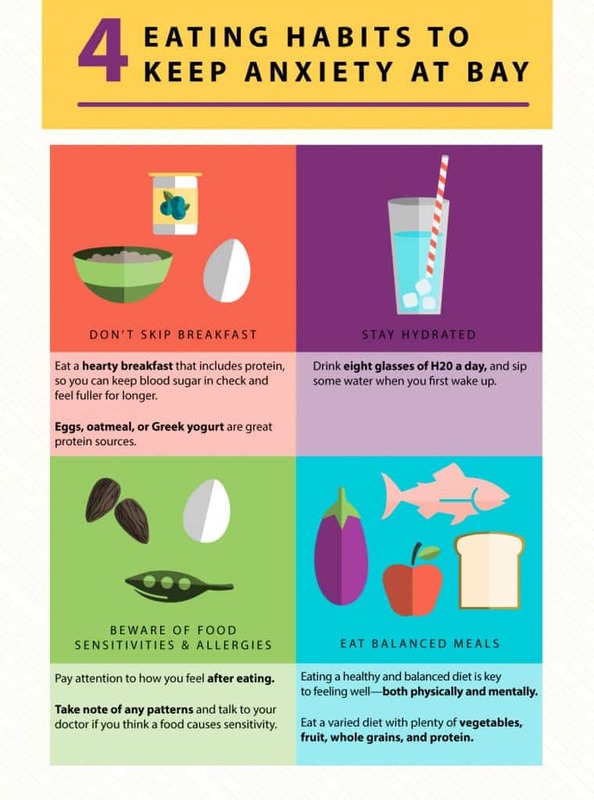 If you’re vulnerable to stress, avoid these eating habits to help feel more levelheaded and calm. Nothing beats that first cup of morning coffee. Still, it’s possible to have too much of a good thing. The reason? Caffeine is a stimulant, which is why some of us feel jittery after that third cup. In fact, studies suggest too much caffeine can increase anxiety, since caffeine stimulates the body’s “fight or flight” response. Coffee lovers don’t need to fret: These symptoms typically occur when people consume more than 500 milligrams of caffeine, which is equivalent to four or more cups of coffee. 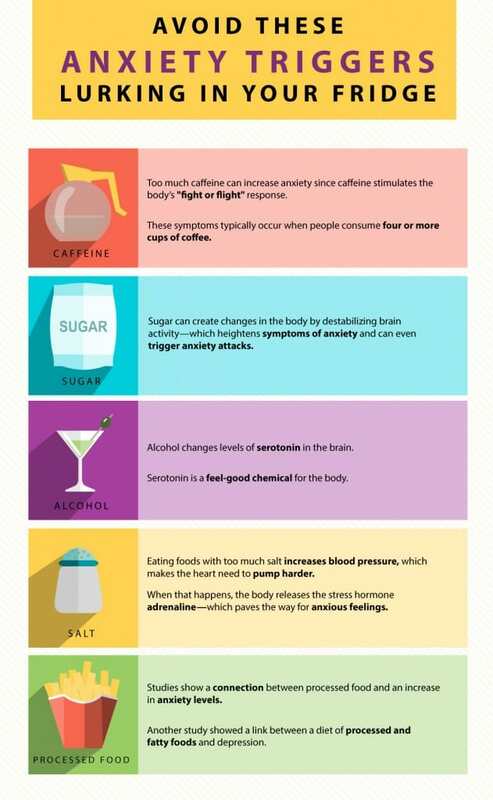 While sugar doesn’t cause anxiety, it can destabilize brain activity, which can then heighten symptoms of anxiety and even trigger anxiety attacks. Not ready to put down those M&Ms just yet? Scientists have also uncovered a connection between sugar and depression. While cutting sugar completely out of your diet is pretty tricky, the American Heart Association recommends a maximum of nine teaspoons of sugar a day, depending on gender. Feeling stressed? One too many glasses of wine may not do the trick to smooth your spirit. Alcohol changes levels of serotonin in the brain. Serotonin is a feel-good chemical, but too much alcohol can lower its levels. This means you can end up feeling more anxious once the short-term affects of alcohol subside. It’s best to stick to one glass of wine or beer at night to keep calm and healthy. Say sayonara to hot dogs and candy corn. Studies show a connection between chomping down on too many processed foods and an increase in anxiety levels. Another study showed a link between a diet of processed and fatty foods and depression. Plus, the highly refined sweetener high fructose corn syrup is also found in most processed foods, and we all know how sugar can affect stress levels. Eating food with too much salt increases blood pressure, which makes the heart need to pump harder. And when that happens, the body releases the stress hormone adrenaline—which paves the way for anxious feelings. Skip excess salt by adding different seasonings such as allspice, basil, and onion powder to food, avoid processed foods, and keep naturally salt-filled food (such as cheese and olives) to a minimum. Wishing it were already time for lunch at 11 am can be … stressful. Make sure to eat a hearty breakfast that includes protein so you can keep blood sugar in check and feel fuller for longer. Eggs, oatmeal, or Greek yogurt are great protein sources and provide the energy you need to start the day as stress free as possible. Even a bit of dehydration can negatively affect the brain and invite unease. Make sure to drink eight glasses of H20 a day, and to sip some water when you first wake up. Spice things up by adding fresh lemon juice or fruit slices. Feeling icky, bloated, or worse—seriously sick—from food sensitivities is never a fun experience. Having bad reactions to food can definitely dampen your mood, so make sure you pay attention to how you feel after eating and talk to you doctor if you think a particular food is affect you. The most common food allergies that trigger the immune system to affect numerous organs in the body include peanuts, shellfish, wheat, and milk. Food sensitivities (which are less serious and allow most people to still eat small amounts of certain foods) include lactose and gluten. At the end of the day, eating a healthy and balanced diet is key to feeling well—both physically and mentally. Your emails contain a lot of useful information and there is no way that I can remember of information in each email. Is there a way to print your emails so I can refer to them later? ?